The Preschool Program is a multi-age program for children of 1 to 3 years of age. 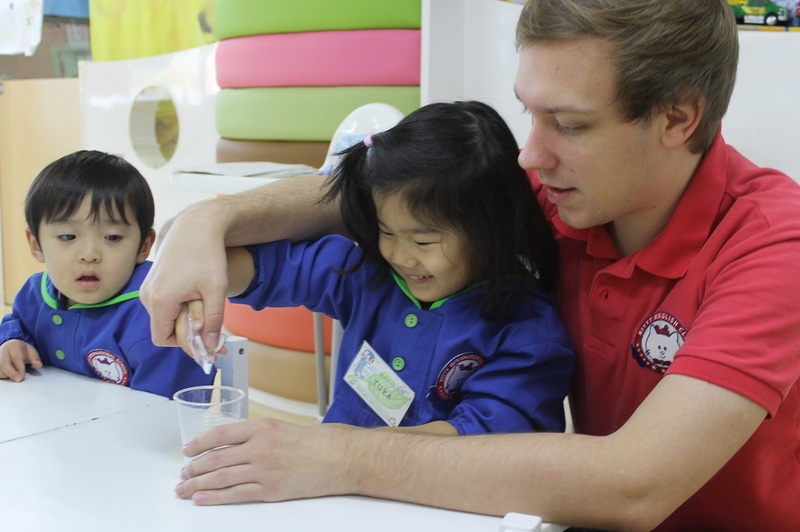 The Kindergarten Program is also a multi-age program for children of 3 to 6 years of age. 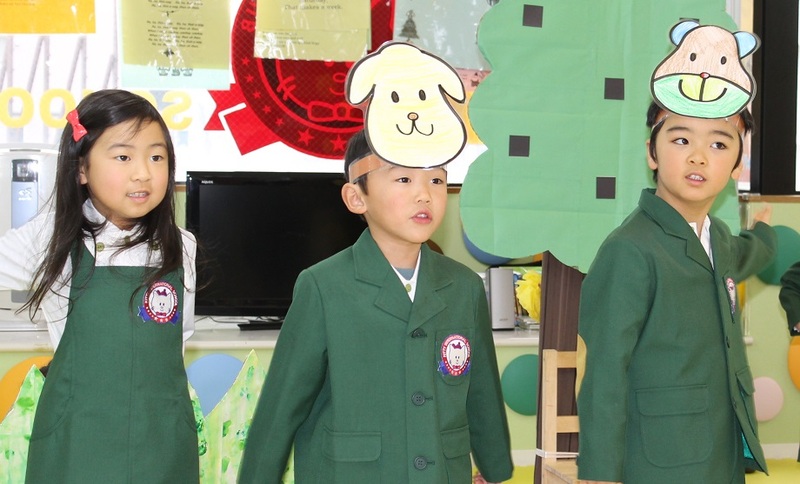 Preschool students and Kindergarten students do some activities together such as morning greetings, sing songs, dancing, etc. And we do other activities in each small group separately such as science, arts and crafts, writing, worksheet study, P.E. etc. School Time: School starts at 9:00-9:30, allowing time for the students to arrive. School finishes at 15:00-17:00 when the parents collect their children. Kindergarten students attend 5 days per week. Preschool students can choose 1-5 days per week. 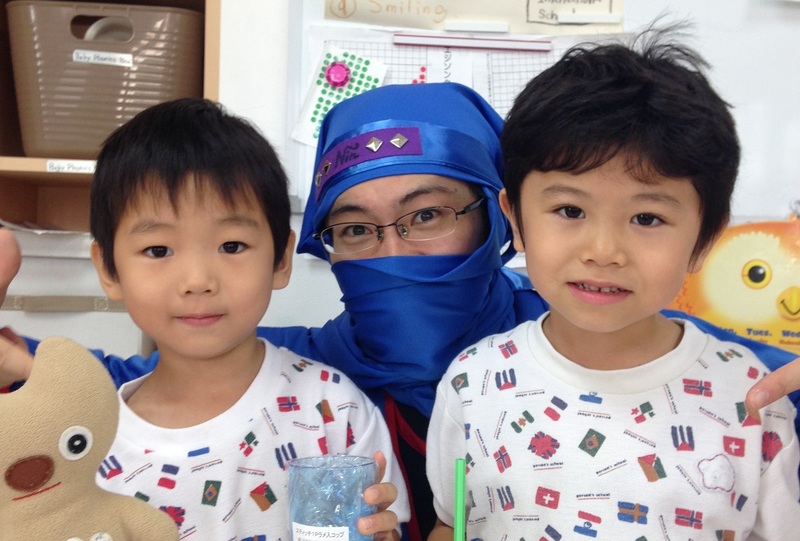 Teachers: One native English teacher and one native Japanese teacher for 10-25 students, depending on the students' ages. Class size: 10-25 students, depending on the students' ages. Teachers and students greet each other with greetings like “Good morning.”, “How are you?” and the students reply accordingly. The teachers then ask for their attendance cards, “Passport, please!” and the students respond “Here you are!” and “Thank you” and receive a sticker for their passport where it is then dated. Sentence cards are also checked for students 5 to 6 years old. Students can relax and settle in with the teacher and classmates by playing together and at the same time learn vocabulary. It is a relaxed and fun setting including popular background music. Along with the clean up song, everybody works together to clean up the toys they used during playtime. Students learn to work as a team to get the work done faster and enjoyably. Everybody gathers together in the centre of the room to sing and dance to the “Hello Song”, and two songs of focus for the month. We also have a unique rythmique series of songs that students learn to sing and perform actions simultaneously. Students settle down in a circle together to practice answering questions like “What’s your name?” “How old are you?” and “Where do you live?”(3 years old or younger). Older students will be asked more challenging questions which will coorelate to the monthly curriculumn. During this time, the children learn to sit down and pay attention to the teacher. Also during this time the class studies the monthly curriculum through repetition and games. This is the point students are able to converse and learn about a range of different themes such as the alphabet, animals, occupations, colors etc. Students learn to sit and read English books with the native teacher and take turns going to the toilet with the Japanese teacher. We have a variety of books that range in level for all young readers. Everybody gets themselves ready to go outside and then go for a walk together and learn the English names of anything they may see along the way. At a nearby park, students have the chance to refresh themselves by playing together outside whether it being in the sand box or bouncing a ball around. We also have a monthly P.E. focus, such as soccer, jump rope, exercises and games. 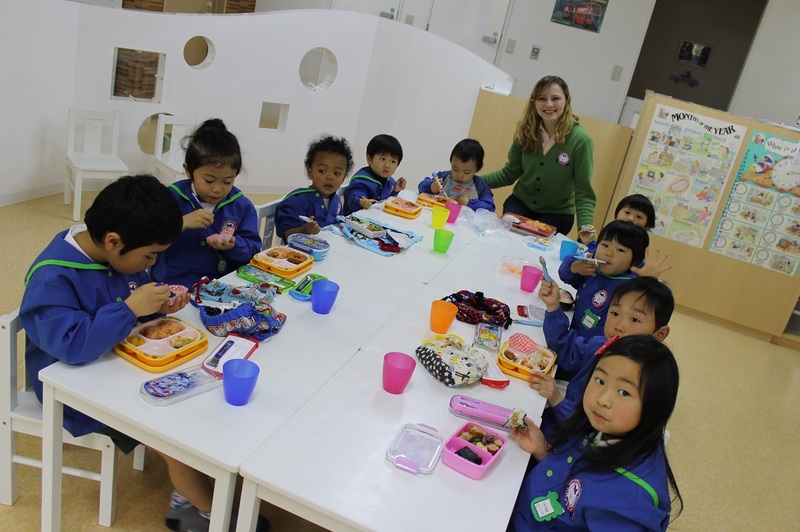 Students and teachers eat lunch together. The children get to practice using their own cutlery and correct table manners. It is another great opportunity to learn vocabulary. Lunches for the students are delivered daily by a catering company. Students learn to play together, playing in group and team games. This includes hide and seek, musical chairs and more! Students develop the small muscles in their hands while drawing with crayons, playing with play dough etc. We also work on English calligraphy to practice writing and reading. 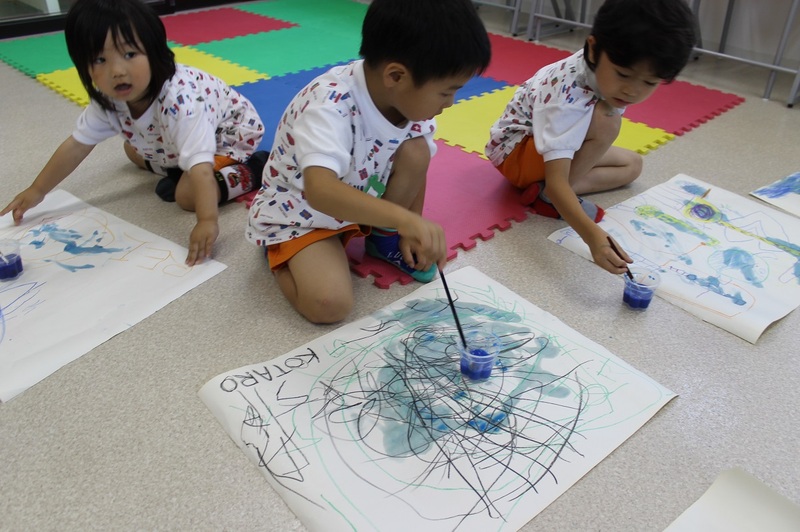 This can be a very creative time for students and they are encouraged to express themselves freely as well as follow directions from the teacher. Using blocks, and puzzles etc, students can exercise their mental agility. They must think quickly to complete challenges from a range of subjects. To relax at the end of a long day, students can sit and listen to a story told by the teacher using the popular talking cards. Older kids are also asked to practice stories to share with the class. At the end of the lesson, everyone sits together in a circle and has their bags and passports returned. Then it’s time for students to join hands, sing the “Goodbye song” together and then go back to their parents.